West Cork hotels? Try something different for a short break in West Cork. For couples looking for cottages look no further. An hour west of Cork, Ireland you’ll find a selection of romantic cottages in the heart of beautiful West Cork. For a luxury short break or longer, our cottages for couples offer something special. These are not just self-catering holiday homes. 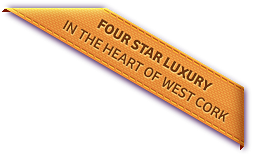 Our cottages offer four star hotel standards in character buildings and, like hotels in Ireland, you can rent them on a daily basis. Situated in the heart of beautiful West Cork, close to Skibbereen, Baltimore, Castletownshend, Schull and Bantry, our luxury cottages are all perfect for two. We have carefully restored authentic stone barns, stables and cottages to provide fabulous accommodation with bags of character. We have then sympathetically added some modern day luxuries to create a perfect place to relax with one another. Bedroom jacuzzis, four poster beds, flat screen TVs, DVDs and even a private hot-tub – so you can indulge yourselves in your own personal and private space.